Meir Wieseltier's verbal power, historical awareness, and passionate engagement have placed him in the first rank of contemporary Hebrew poetry. 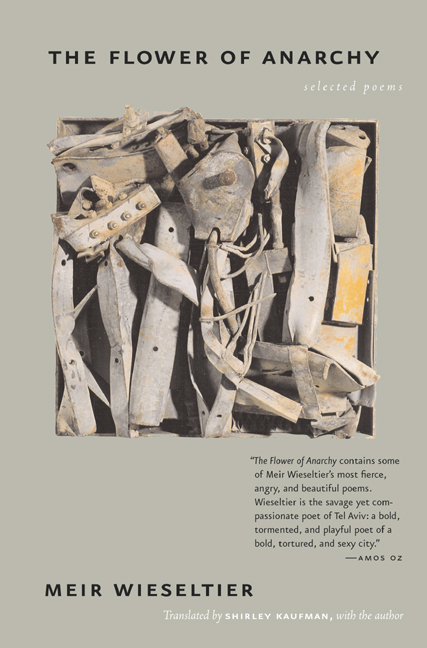 The Flower of Anarchy, a selection of Wieseltier's poems spanning almost forty years, collects in one volume, for the first time, English translations of some of his finest work. Superbly translated by the award-winning American-Israeli poet-translator Shirley Kaufman—who has worked with the poet on these translations for close to thirty years—this book brings together some of the most praised and admired early poems published in several small books during the 1960s, along with poems from six subsequent collections, including Wieseltier's most recent, Slow Poems, published in 2000. Born in Moscow in 1941, Wieseltier spent the first years of his life, during the war, as a refugee in Siberia, then again in Europe. He settled in Tel-Aviv a few years after coming to Israel in 1949 and has lived there ever since. A master of both comedy and irony, Wieseltier has written powerful poems of social and political protest in Israel, poems that are painfully timeless. His voice is alternately anarchic and involved, angry and caring, trenchant and lyric. Meir Wieseltier studied at the Hebrew University in Jerusalem, published his first poems at the age of eighteen, and has won many literary awards, as well as the Israel Prize, his country's highest honor for lifetime achievement, awarded in 2000 by the Israeli establishment to its most anti-establishment poet. Shirley Kaufman, prize-winning American-Israeli poet and translator, has published eight volumes of her own poems, the two most recent of which are: Roots in the Air: New and Selected Poems (1996), and Threshold (2003). She has also published several books of translations from Hebrew of the works of Amir Gilboa and Abba Kovner, and from Dutch of the work of Judith Herzberg.